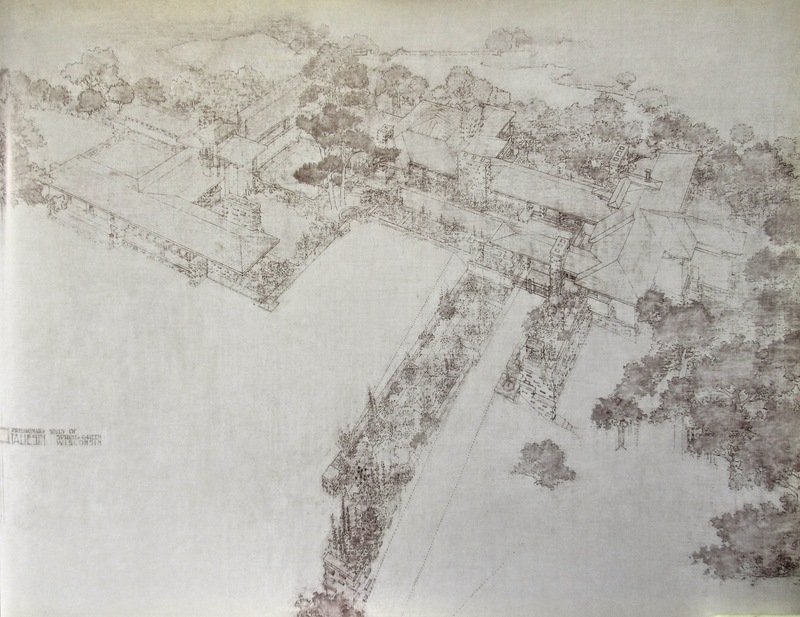 I titled this post Taliesin 1-ish for the reason (probably obvious to the members of this forum) that there does not appear to be a definitive plan set for the original Taliesin. So, any attempt to recreate T1 involves lots of sleuthing and some degree of guessing. 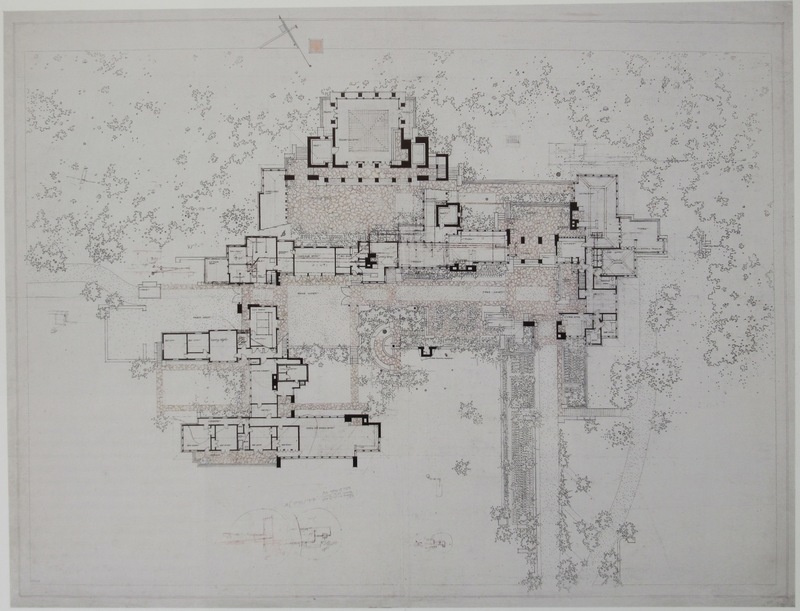 Some of my sources are the multiple versions of the plans out there, Ron McRrea's wonderful book, Building Taliesin, and all of the shared work/research by members of this forum and Wright community. The model is also a product of compromises necessary to meet the requirements of 3D printing at this scale. The stone work, shingles, color and other details have been simplified or sightly thickened to meet minimum print specifications. Sadly, the decorative wooden window grills and other enriching details had to be omitted. I am a newbie to 3D printing and am currently working through some issues with thicknesses—too thin in some areas, too thick in others. Of course, you want to hit a sweet spot to make it printable while also reducing material volume where possible. Anyway, I thought the nature of this simplified model resulted in some interesting bird's-eye representations that might add to the ongoing explorations of T1 here. I will follow up with some more images that give a closer look at the courtyard areas of the model. P.S. The flags near the tower in some of the images were added post model rendering. They appear in some historic photos and I was curious about the effect. That fragile detail could not be printed at this scale. Beautifully done JJM! The model is extremely fine and gives me a better impression of Taliesin I than anything else I think I've seen, particularly the aerial view looking straight down. The whole presentation is fantastic. Magnificent. I agree with the observations made by Meisolus; this work is a great boon to those studying Taliesin 1. What is the overall size of your model ? What does it weigh ? To what degree is it hollow ? Was there any difficulty in achieving the cantilevers or overhangs ? Your presentation, presumably via edited photography, is fitting and handsome. Would a few close-up views be helpful, or is it best, considering the slight adjustments you had to make, to see the model as a whole ? I have a printer. Where can I get the model? Wowee ! Very nice ! It occurs to me that it would be a great exercise to have side by side by side models of Taliesin 1, 2, and 3 at the same scale, right next to each other for comparison. I had trouble with an old email attached to my JJM account. Long story short, I am now JJM2. The images shown above are computer renderings of a computer model. The model was created at a scale of 1:300 and the base measures 8" x 12". The house and base are hollowed out to save materials and weight. Right now this model would weigh 100g if printed. This is by far the largest thing I have attempted to 3D print. There is still much work to be done to get the model ready for print, including optimization of thicknesses. So, a work in progress for now. I hope to post images of the courtyard and other details soon-ish. P.S. I forgot to mention that the flange at the base of the model is meant to serve as a way to capture/mount the 3D print in a wood base frame. I wanted to add a warm, natural material and build in the flexibility to display the model on a tabletop or a wall. Aha. Great idea; I've wondered if architectural wall art isn't a neglected niche. And yours is a jewelry-scaled gem. It will intrigue when seen first as an aerial graphic bas-relief, and then draw the eye closer as detail becomes evident. 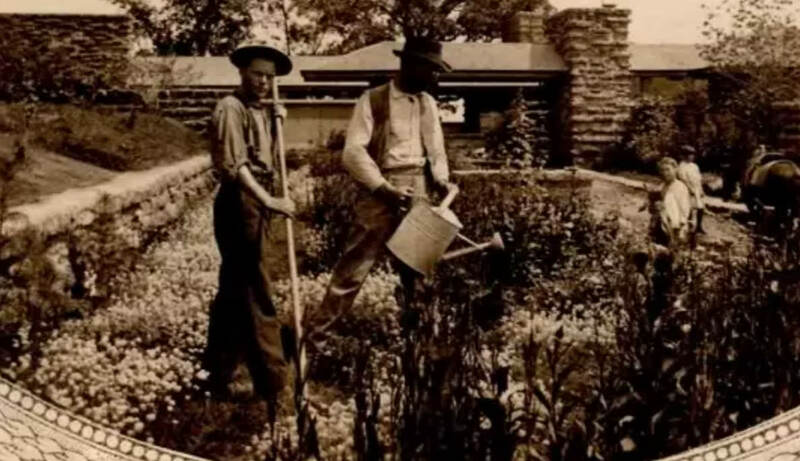 the "farm" terminus may have been under-appreciated, on the whole . . .? Do keep us informed. The renderings are smashing. Thanks for all your hard work ! The roof plan shows a pristine orderliness about T-I that is somewhat lost in T-III. I would say the experience of T-III is superior to I or II, but in plan (and SDR's long-ago professor would agree with me), T-I is superior. 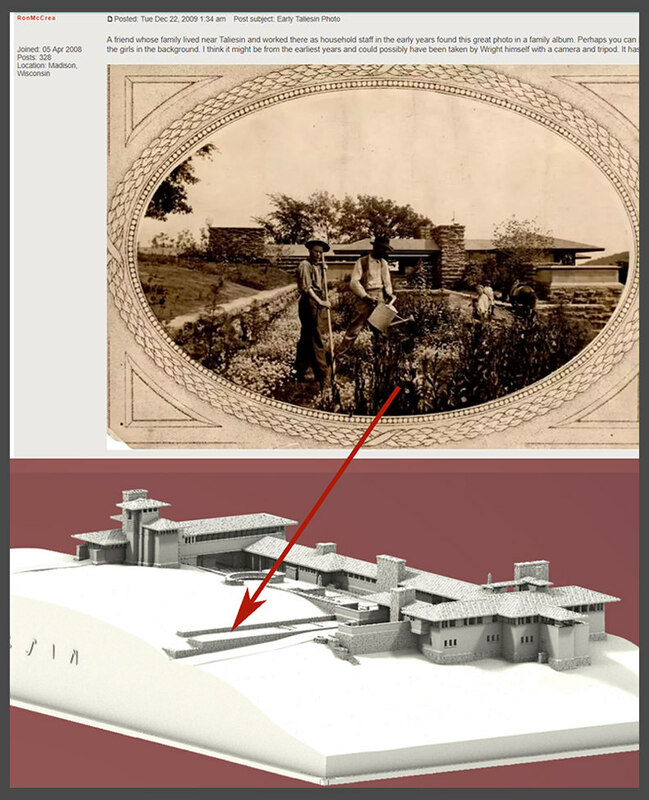 Looking at the model images, I was wondering about the low walls beside the entry driveway beside the living quarters, then saw this photo again, which is interesting to refer to the model. 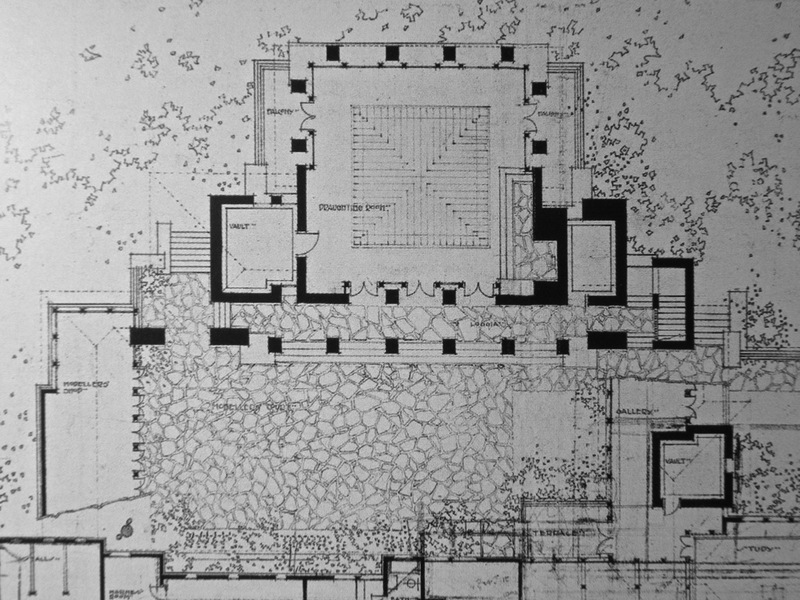 Taliesin drawing 1403.018. presumably dated 1914, apparently a prevision of the second iteration of Taliesin. For what it's worth, the wall configuration James finds in the new digital model seems to be present -- or nearly so -- in this drawing. We haven't asked yet what version of Taliesin I is employed in JJM's new digital model . . . have we ? The drawing above is published in Taschen I, p 479. Three interesting structures are depicted thereon. The last and least appears to be the foundation for a future Birdwalk, though the object is in fact labeled "Lighting Plant." 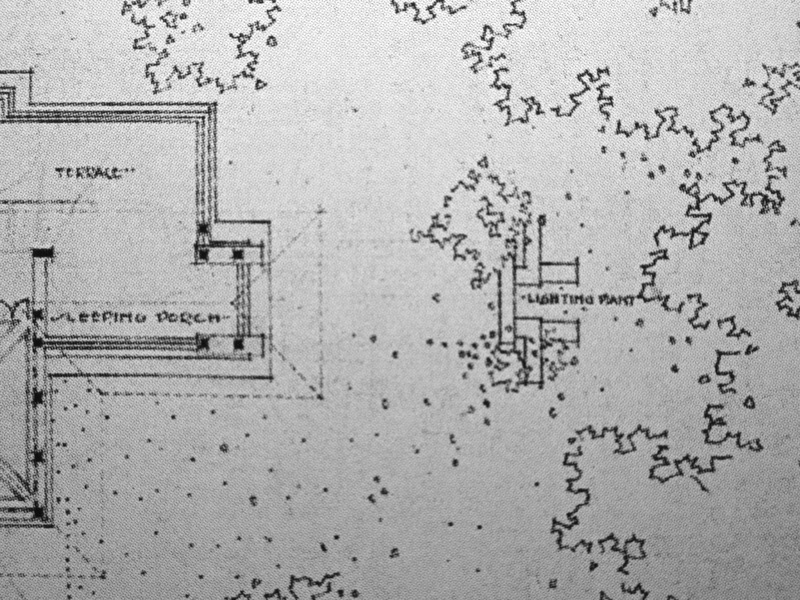 These features are also seen in this contemporaneous birds-eye rendering, Taliesin 1403.022 (Taschen I, p 471). 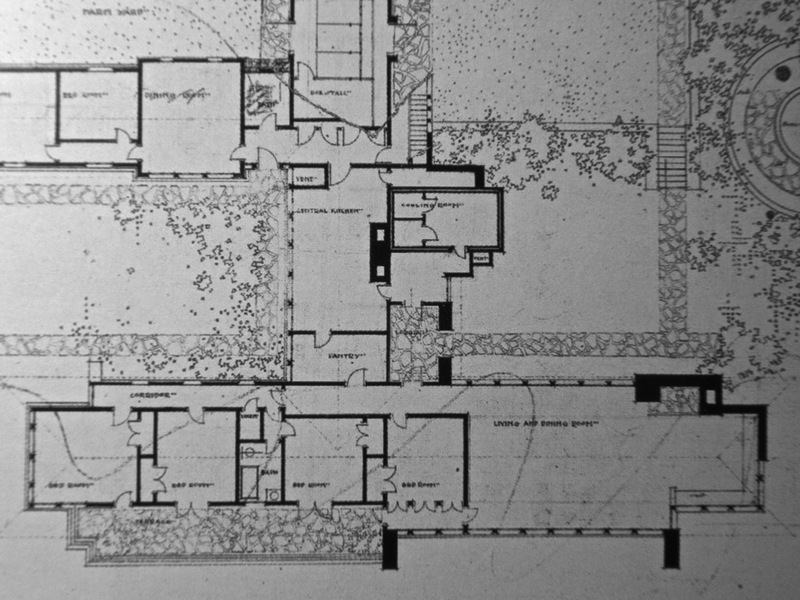 Is that a prototype Usonian house at center left (detail 2, above) ? That note for the "lighting plant" is an interesting one. I'd seen up under the birdwalk and wondered what is that little cube at the base. It appears to have a tiny, white door on the back side. Perhaps, it has something to do with your "lighting plant" note (?). 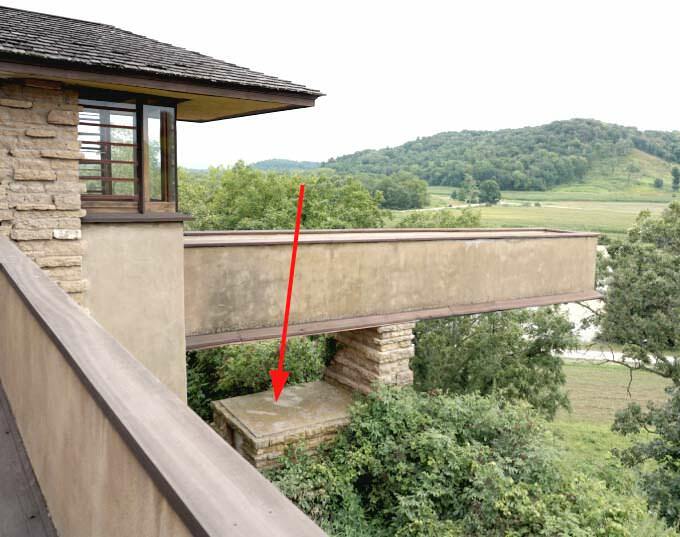 Would it be the case that around the time of the Taliesin II design drawing the only reason to bring in electricity would be to power electric lights? I guess most electrical appliances hadn't been invented yet, so only lighting would have the requirement at that time. Is that right? Later, we hear of the hydro-electric plant being installed at the dam below. This location would be logical to bring that power line to. 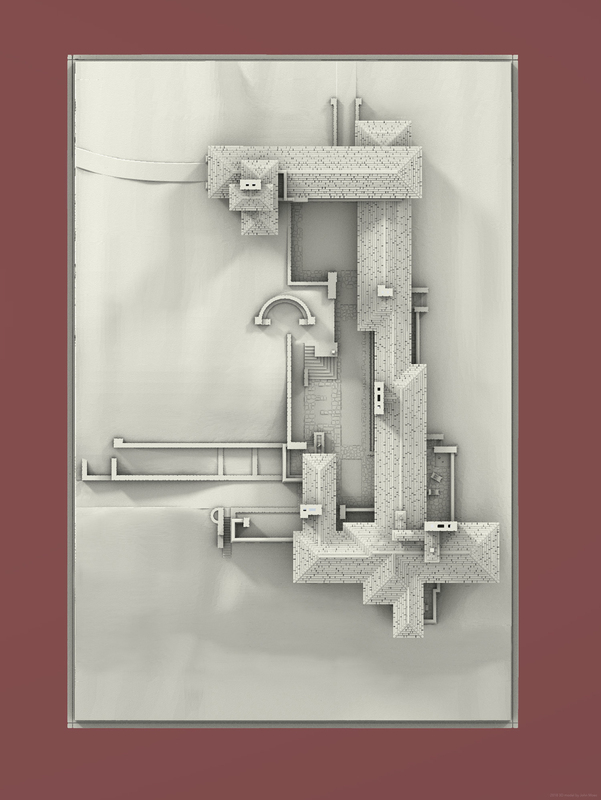 So, if those assumptions are right, would that little room with a door up under the birdwalk be the vestige of that "lighting plant" that you noticed on the drawing? an early-days electrical room? The only thing beyond lighting that comes to mind is electric refrigeration. So I went looking for the history . . .
"In 1913, refrigerators for home use were invented. In 1923 Frigidaire introduced the first self-contained unit. The introduction of Freon in the 1920s expanded the refrigerator market during the 1930s."